The first month of archery season had really proved to be very unproductive. I had taken a few does, but the buck sightings were really down. In fact, going into the first of November, the best buck I saw was a young 6 pointer. The worst part was that I had spent so much time on plan A, I did not even have a plan B. However, this was all about to change. I had taken November 13th to the 22nd off from work, and planned to spend every minute of it in the stand. I invited two good friends of mine, Jeff and Alan, to hunt with me. Alan was going to bow hunt and gun hunt with me the 14th to the 19th and Alan and Jeff were both going to gun hunt with me the 20th to the 22nd, plus my two boys, Zac and Hunter. November 13th, 14th, and 15th were very slow all day hunts, with very few deer sightings to show for it. The morning of the 16th I was hunting a ridge top that tied to other ridges together, which had a fresh scrape line on it. Around 10AM I looked to the north and saw a HUGE buck working in my direction. The closest he got was around 50 yards, but it felt great to finally get my eyes one of the true giants that I knew this farm could produce. I texted Alan on what I had just seen and as soon as the message was sent, my phone was ringing. Alan informed me that he just shot a very nice 10 pointer. We quickly covered all the important information and decided to give the buck an hour before getting out of the stand. We started to track the buck around 11am and we found his 10 pointer after a quick 60 yard track job. We field dressed the deer and dragged him to the truck. Once we were done, I headed back out and got into the stand around noon. About 30 minutes later, I saw a great 8 pointer headed straight to me. He offered me an easy 20 yard shot and I placed an arrow through both lungs. I found my 8 pointer after another fast and easy track job. We took a few pictures and started about the task of dragging him out to the truck. We headed back home that night to get the two bucks capped out and to the taxidermist. The plan was get a good night of sleep, and head back out to the stands by mid morning. We arrived at the farm around 9AM on the morning of the 17th, but it was absolutely pouring rain. We decided to head to my camper and wait for a break in the weather, which never came. Wednesday morning we woke to yet more rain, but decided that we could not kill deer from the camper and headed out. We sat all day and I don't believe it ever stopped raining. For our efforts we saw just a few does and no bucks. Thursday morning, the weather finally broke, it was the day before the gun opener and I was feeling good about filling my last buck tag. The morning was cool and crisp and the bucks were back on their feet. Alan and I both sat all day again and we both saw several good bucks, but were unable to close the deal with a bow. However, tomorrow morning I would have a gun in my hand and again felt it was just a matter of time before I filled my last buck tag. Jeff arrived at the camper that night and we prepared our plan for in the morning. We told Jeff about all the bucks we had seen that day and he was smiling like a kid on Christmas morning. The plan was to do all day sits again as most of the deer movement was happening mid day. Around 8AM I had another beautiful 8 pointer come into my stand location, but he had come in from behind me, and I never knew he was there until he was less than 30 yards away. I started to stand and turn in my stand when he looked up and saw me. I knew I had just been busted. He stopped and stared at me for a few seconds and then turned and made his way back down the ridge. He never offered me a clean shot. Around 9AM that morning I heard Alan's 20 gauge go off and was excited at the thought of another good buck on the ground. Alan called and informed me he had shot a doe and was going to leave her lay for a while. Around noon, he started to drag her out while Jeff and I stayed in the stand, as Jeff and I were seeing a bunch of deer. But just not the buck we were waiting for. I heard Jeff's muzzleloader go off around 2 that afternoon and he was calling before I could even get my phone out. He informed me he had just shot a very nice buck and that it was down in sight. I asked him to stay in the stand and let me finish the evening hunt and we would get his buck out after dark. 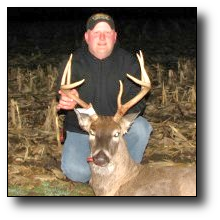 I made my way to Jeff's stand at dark and found him standing over a very nice mainframe 8 pointer with a busted brow tine. This week was turning out better than I had ever expected, and with my two boys arriving that night, I just knew that more deer were going down the next day. Zac and Hunter decided to hunt stands that had not been hunted all week. It was a perfect morning as we got into the stand. No wind, and just a bit of chill. I heard Zac's 20 gauge ring out about 30 minutes after daylight. I discovered that I had forgotten my phone at the camper. I stayed in the stand for about 30 minutes, but not knowing what was going on, was killing me. So I started making my way to him. I found Zac, nice and calm when I got to his stand. I asked him if he had hit whatever he was shooting at, which he informed me had and thought he heard it crash just out of sight. Zac had killed his first antlered deer with a bow this year and had been talking about how he was not going to shoot a small buck. So I asked if had shot a buck or a doe and he replied he had shot a buck. So I then asked if had shot a good buck or a small buck and he smiled and told me that he indeed shot a small buck. He told me that he thought it was a 4 pointer. I told him good enough and had him climb down. We went to where the deer was standing and starting following the blood trail. Zac spotted his buck after a short 30 yard track job. He said "that is a lot better buck that I thought". He was right. He had killed a very nice 110" 8 pointer. Hunter decided to go to the stand that Zac had shot his buck from. We were not back in the stand for more than hour when I heard Hunter's 20 gauge rattle off. A few minutes later Hunter was calling me to tell me that he had a buck down. 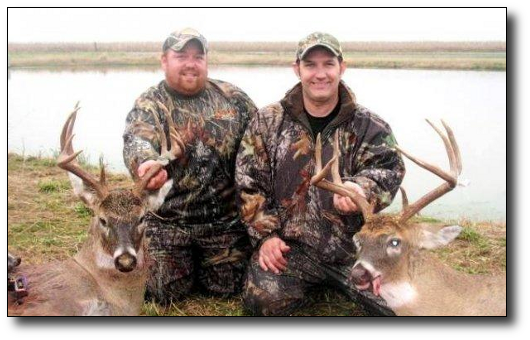 I could not believe it, the same day, the same stand and both boys had bucks down. I could not have been more proud. I told Hunter to stay in the stand until dark, but I could not wait and climbed down around 3 to go see what he had down. Another very short track job and we found Hunter's neat 6 pointer dead. My second buck never came along, but all-in-all I cannot complain. 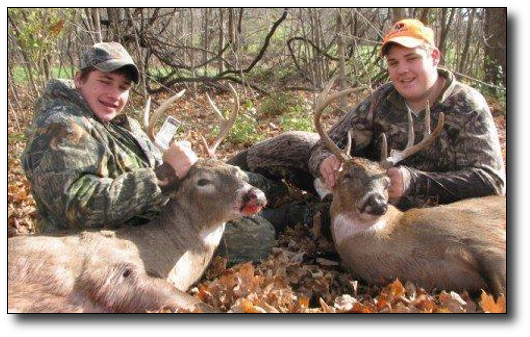 Both of my good friends were able to get on nice bucks and my two boys were able to get their bucks. A great week of hunting with my friends and family, which is what hunting is all about. I would like to thank everyone at HSP for doing the great job they do, which make seasons like this possible.